Mod: The League of California Cities likes to present itself as being a voice of authority when it comes to many of the important issues facing little towns and cities in this state. The following legal exegesis was written for The League by Christi Hogin (link), city attorney for Lomita, Malibu and Palos Verdes Estates. It is also the approach Sierra Madre's City Council will likely be taking soon. Needless to say, federal and state government has not put your interests first in this case. A link can be found here. Sober Living Businesses in Residential Zones: Current law limits local regulation of sober living homes and residential alcohol and drug rehabilitation (rehab) facilities. These uses have become lucrative businesses in many instances, and their operation in single-family neighborhoods is sometimes controversial. This article presents the current legal constraints and considerations for cities related to these homes and facilities. 1. Licensed residential rehab programs are subject to the same (and no more) local laws as single-family homes. Cities may regulate land uses to protect the character of residential neighborhoods. This authority is not unfettered. State and federal law can pre-empt local regulation. State licensing statutes expressly exempt certain residential rehab facilities from local zoning regulations. Alcohol and drug programs (ADPs) that provide 24-hour residential nonmedical services to adults who are recovering from alcohol and/or drug abuse must obtain a state license. If a licensed ADP facility serves six or fewer patients, state law prohibits cities from regulating it any differently than a single-family home. 2. State law imposes fewer restrictions on licensed residential rehab programs than other licensed group homes. State-licensed group homes are subject to different restrictions. The Community Care Facilities Act, from which alcohol and drug rehabs are exempt, imposes various restrictions that protect the character of residential neighborhoods. For example, under the act, licensed foster homes cannot be for-profit businesses. ADPs, however, may operate as for-profit enterprises in residential zones without business licenses because licenses generally are not required of other single-family uses. Cities receive written notice of a proposed Community Care Facilities Act facility, and “any city or county may request denial of the license … on the basis of overconcentration of residential care facilities.” The state does not provide any notice to cities before a new ADP license is issued. The attorney general has opined that the state “may not deny an application for licensure or suspend or revoke the license of a treatment facility because the particular community already has more than a sufficient number of treatment facilities to meet the local need.” With that conclusion, the attorney general determined the Legislature’s reference to consideration of “local need” in approving ADP treatment facility licenses did not establish a basis to limit their numbers in any neighborhood. 3. Sober living homes do not require a license and are not limited to six or fewer residents. A sober living home provides a substance-free, mutually supportive living environment for adult recovering alcoholics and drug addicts. No services are provided but residents may engage in self-help programs individually or with others. The state licenses residential facilities that provide nonmedical treatment and detoxification services. Where no treatment is provided to residents, no license is required. The limitation to six patients is part of the state statute. Because the license statute does not apply, sober living homes are not limited to six residents per single-family home. Also because the statute does not apply, cities are not pre-empted by state law from regulating these uses. However, as noted below, other legal considerations apply. 4. Anti-discrimination laws and “reasonable accommodation” requirements limit categorical regulation of sober living homes. Federal and state fair housing laws protect people with disabilities from housing discrimination. Recovering alcoholics and drug addicts are disabled for purposes of anti-discrimination laws. When people in recovery live together in a “sober living” home, cities cannot discriminate on the basis of the disability, which means an ordinance cannot treat sober living homes differently than other similar uses in single-family residential zones. Recovering alcoholics and drug addicts are also protected under the federal Americans with Disabilities Act (ADA). The ADA requires cities to reasonably accommodate deviations from zoning laws to afford persons with disabilities equal opportunity to enjoy housing. For example, a city may define “boarding houses” as more than three leases in a single home and prohibit boarding houses in single-family zones. Sober living home residents, however, may seek a waiver from enforcement as applied to them as reasonable accommodation to their disability that may benefit from a substance-free group living environment, allowing the ADA protection to exempt the sober living home from the “boarding house” prohibition. The Fair Housing Act Amendments of 1988 prohibit local governments, among other things, from discriminating against the disabled by establishing a bedroom/per occupant rule, imposing distance requirements between facilities or prohibiting commercial operators from running sober living facilities in residential neighborhoods. Likewise, requiring a sober living home to obtain a conditional use permit, business license or home occupation permit would impose requirements on the residences of “handicapped” persons that are not imposed on other residences. a. Discriminatory treatment occurs when a protected class of persons (recovering alcoholics or drug addicts) is subjected to different treatment under a law. Discriminatory treatment is illegal unless the different treatment benefits the protected class or responds to legitimate safety concerns. A facially neutral regulation (that does not treat a protected class of persons differently) may still be illegal if evidence establishes that the intent of the statute is discriminatory. Regulations must be justified by legitimate, nondiscriminatory nonpretextual reasons. b. Disparate impact occurs when a regulation has a significantly different and adverse impact on a protected class. c. Failure to make reasonable accommodation of rules, practices, policies and services for persons of a protected class constitutes discrimination. An accommodation is reasonable unless it requires a fundamental alteration in zoning regulations or imposes an undue financial or administrative burden. A recent case suggests heightened standards for local ordinances challenged as discriminatory. The City of Newport Beach adopted an ordinance that appears neutral because it applies to group living situations (distinguished from single housekeeping units) but does not single out recovering alcoholics or drug addicts. Newport Beach was sued for discrimination by plaintiffs claiming that the ordinance’s intent is to regulate sober living homes in particular. The Ninth Circuit ordered a trial to determine if Newport Beach enacted the ordinance with an intent to discriminate based on certain evidence that it was the city’s purpose and because the ordinance “had the practical effect of prohibiting new group homes from opening in most residential zones.” A petition to the U.S. Supreme Court for review of the ruling is anticipated shortly. 6. Regulation to benefit the protected class is allowed. Relying on cases interpreting the federal Fair Housing Act, the California Legislative Counsel has opined that “sober living homes” may not be subject to distance requirements, unless the regulation benefits the protected class or responds to legitimate safety concerns raised by individuals affected rather than being based on stereotypes. The italicized provision marks the intersection between local and state interests. Cities exercise zoning power to protect the character of residential neighborhoods. 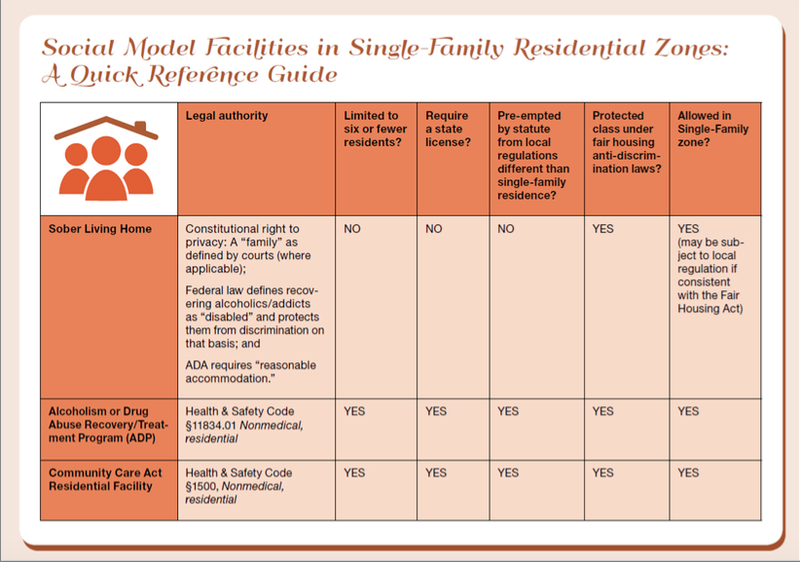 The policy underlying state law pre-emption is to provide care in a residential setting. The antidiscrimination laws are intended to protect equal opportunity to enjoy housing opportunities. Maintaining the integrity of residential neighborhoods is necessary to provide the beneficial setting and the housing opportunity. Many would argue that distancing requirements both respond to the biggest concerns of local government and advance state policy. As more communities gain experience with the effect of unregulated uses, implementing antidiscrimination statutes may soon demand what they now appear to prohibit. Cool! Sober living homes aren't limited to 6 people. What a great profit margin when they can pack 10-15 people into the house on Carter!! The UUT and water revenue will be huuuuge. With news like this I might consider giving up drinking? What, and miss out on all those good government benefits? This is the down side of the redefining of "family". A family that shoots together, loots together. Bunches of people in group homes using lots of AC, etc. The city will love collecting more and more 10% UUT tax on that! So we don't want drug rehabs here,I get it . The reality is,it's money are city needs to pay for pensions and infrastructure ...If a rehab gets your undies in a bunch ,what do you think a housing development on 22 acres of prime monastery land is going to do to your sensitive backsides? The money will win people because you have nothing else to offer . For instance some would like the 22 acres at the monestary to be an Eco-sensitive open space for all to enjoy . In the world of unicorns and fairies it's a nice idea ... But,here are the realities . Who will manage this property and keep the masses respectful,and how will people be paid ? Will you be willing to put aside two acres of land for a visitors center,bathrooms,and parking ? One acre of land will afford parking for 100 to 110 cars at $5.00 to $10.00 for special events ... Are you willing to charge those fees and hire people to keep the parking area civilized and respectful? What about the neighbors ? Good luck with that hurdle,this is a city that can't handle the celebratory noise of Alverno High School's graduation. One night out of the year that's supposed to filled with celebration is turned into polite hand clapping and muted cheers because at the start of the celebration we,the proud family and friends are advised that "If you have any air horns or excessively loud noise makers you will be escorted off the property because the neighbors don't like the noise "
Seriously,one night out of the year ? "Caprichitos " as it's the one thing this city does with absolute perfection . Alverno is hardly noisy one night of the year! Try every week when they have drunken wedding parties? They are very interested in money, renting the place to movie people, wedding celebrates, and any one else willing to pay. They don't care about the neighbors, the announcement was for show only. All right, I don't believe anyone will stop building at the Monestary in the long run. We will not be able to stop drug houses. As our pretty little town saunters into demise, let's look at priorities. Alverno is a small school of all girls. They aren't allowed to have dances. If they have any function, it must end at 10:00P. Yes, they rent out for movies and weddings. Doesn't the city benefit from permits? The city needs the money. Also, venerable St. Rita's has activities. Does anyone complain about that? There is little in this "family" town for kids to do except the few things the city puts on. There is no soccer only Little League which is inviolate as St. Rita's. These are kids we're talking about. SM is supposed to be all about kids. But not after 10:00P.M. The Library holds a function at Alverno every year. Is there a complaint about those drunken wine tasters? Or do some of you have "I heart my Library " signs in front. I would like to see some of the houses on Wilson look better. Maybe do a little weeding and painting. As for the man who insists on not wearing his shirt when he cultivates his weeds, I say get a shirt! St. Rita's is interested in money why not Alverno? You seem to be a real sour puss 2:09 PM. Where do you live? I have an old toilet you can put in your front yard and grow daisies in. It's drought tolerant! I would never want to deprive you, 5:41PM, of the only equity you have in your yard. My generosity knows no bounds. As for you, 1:28PM, beautiful? Maybe once, but not much longer. Enjoy the druggy homes you won't be able to stop, enjoy the disrespectful kids on Kersting Ct., enjoy your lack of transparancy government. I don't hate you because you think you're beautiful. I dislike you because you're a bunch of idiots. 1:28 here. I'm not feeling the love. Guess I'll go to a safe space. Say, City Council chambers. So 2:09 is Alverno as loud as La Salle during football season ? As far as the movie crews go you do realize that they have to pay a permit fee to the city and not just Alverno . What's your take on the library wine tasting event ? That's okay because it's money for the beloved library ...Right? You're probably one of those people that live in one the homes in and around Alverno that hasn't seen a paint brush since 1970,always has its shades drawn,has a weed patch for a lawn,and looks like a hoarder lives there . Along with those issues you probably hate little kids that play outside and set one foot on your weed patch and have probably considered poinsioning the neighborhood dog because it barks. Frankly,Alverno should cut its loses sell it's property,move to Pasadena ,and let developers build Alverno Heights Estates. Maybe one night you should stroll over to Alverno,crash one of the wedding,and raid the booze because you sound like you need a lot drinks to loosen up your tightly twisted up backside . P.S. May the next rehab move next door . When it comes to rehabs and half way houses we lose and there's nothing we can do about it . Regarding the monastery property it might be a good idea to look into Oceansides So.California Sports Complex,Norco's Silverlakes Park,or how extra property is utilized by the Irvine Ranch Church. Lots of money can be made not just for the city ,but for local businesses as well . If we build it,they will come. Hatred for what? I am not certain how sainthood is required of people being asked to accommodate in their community people who have broken some very serious laws.